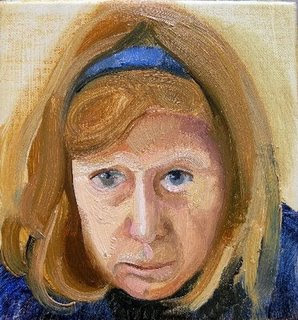 I did this little study of my friend and fellow painter Anne Holiday a week or so ago and I'm now starting a slightly bigger and more ambitous portrait of her. I prepared my surface by gluing a fine weave linen canvas to 9mm thick MDF. I use a traditional animal hide glue which is put on hot to the MDF board. 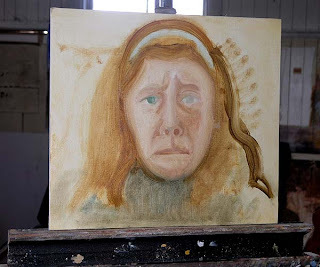 I then lay the unprimed canvas over this and I iron the canvas with a warm iron to adhere it and smooth out the bumps. When this was dry I trimmed the edges and gave the linen three coats of Liquitex Acrylic Gesso sanding between coats. The dimensions are 400x450mm, for a head and shoulders approximate life size portrait. Here is the result of the first sitting and it is little more than a very rough idea. I gave the whole canvas a thin stain of yellow ochre and then started drawing with a paintbrush. I initially had the canvas up the other way - it's slightly off square - but I felt it would sit better with it slightly wider, rather than taller. 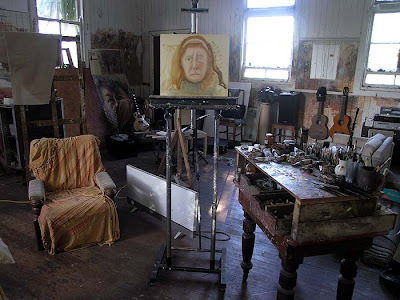 I had made marks on the floor for positioning Anne's chair and my easel to the same arrangement as when I made the small sketch. I want the light to just catch the shadowed side of her face. The direct sunshine was coming in the window and lighting up Anne's bright orange shoes, which was putting me off, so we had to throw a rug over her feet! 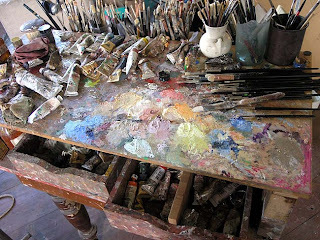 Here is my work table/palette. I never seem to have any fixed order with laying out my tints, though it's not quite the chaos it seems! I generally mix up the tints I think I will need with Flake White. I find flake white difficult to get now as it is considered dangerous because of it's lead content, so I grind my own from the powdered pigment. I purchased the last quantity of lead carbonate available in New Zealand, which will last me a while, after that, I will have to find another source. For a portrait I generaly use tints of natural earth colours, raw umber, sienna, ochre, terre vert, etc. I am also fond of the Mars range of pigments, which are synthetic oxides. The Mars Violet and reds, make wonderful violet tones for shadows. I also use cadmium yellows. My blue is either cobalt or ultramarine. I've also started using more black in my palette, both Mars Black and Ivory Black. Love your studio space I bet it's full of all sorts of goodies! Thanks Heather. Yes, I'm very fortunate having such a big airy space to work in!